O: Good morning, my distinguished wife! Me: ‘Morning, husband! Where’s my downstairs morning kiss? O: I can’t, my mouth is…foaming. O: No…so what do you call it when you first wake up? It’s not foaming? Me MIT, only know numbers; you Harvard, know words. Me: Very funny. Why are you looking like that and patting my face? Is it the rabies? O: I’m trying to be lovely! Or is it loving? Me: In this case, it is both. Like an equation. Do your friends always say you should write about your life? Do you have family stories or travel journals you’d like to tackle? Does your writing project need a shot in the arm? My generative exercises are a low-pressure way to keep that New Year’s resolution to make more time for your writing. 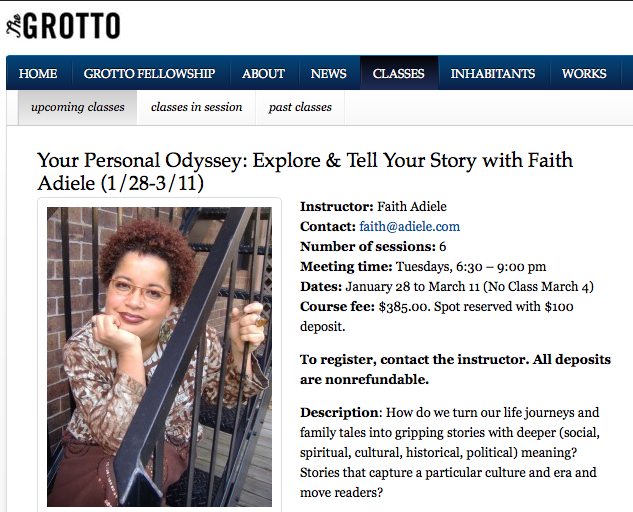 Only 2 more weeks to register for Your Personal Odyssey: Explore & Tell Your Story, a 6-week workshop at the San Francisco Writers Grotto.